If game agencies cannot, will not, manage the rest of the wildlife resources in a proper manner, then they should only be allowed to manage the ones they are being paid for, game species. This excludes predators which they only "manage" (kill) in response to hunters' cries for more game. All nongame species should be wrenched from game agencies' grasps and given to new standalone state wildlife agencies who cater to the 95% of the people who REALLY pay the bill for wildlife habitat. State University of New York at Oswego. A cougar biologist takes a strong stand on the real value of wildlife. In this important opinion piece, John Laundré considers the public cost of wildlife mismanagement, and the consequences of bureaucratic decisions that fail to consider the public good and the intrinsic value of wild predators. More and more we as a society are facing problems with how wildlife of all types are managed in the United States. We see increasing conflicts and polarization between hunting and anti-hunting groups. On the one side, invoking the pioneer tradition of our ancestors, hunting groups contend that the right to hunt is undeniable and is essential to the sound management of our wildlife resources. On the other hand, anti-hunting groups contend that the need to kill wildlife animals is no longer justified and hunting represents a next to barbaric act against living, feeling animals. 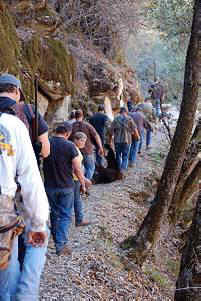 Long line of hunters on a mountain trail. Hunters contend that they are the only ones who should have a say in how wildlife are managed. On one side, hunters contend that because they pay the bills for the management of wildlife resources through their licenses and a federal excise tax on their hunting equipment, they are the only ones who should have a say in how wildlife are managed. On the other side, anti-hunters argue that moral objections to the slaying of innocent animals overrides any priority as to who has a say in these matters. And the arguments go on and on. Both sides have their army of lawyers and donating members to support the lawyers. Each spends millions of dollars for their causes and sometimes hunters win and other times anti-hunters win battles but the war goes on, seemingly without end. Should it be that way? Should we manage or mismanage our wildlife resources though the press, through the courts? Who should have the say over wildlife management and what should that say be? Given that hunters only comprise 5% of Americans of hunting age and approximately 16% of Americans disapprove of hunting, anti-hunters outnumber hunters by three to one. In the land of majority rule, should not the majority hold sway over the minority? But 16% is far from a majority of the American people. What about the other 79% of America? Should they also have a say? And if they do, what would it be? 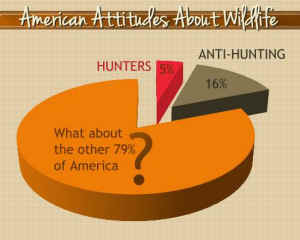 Of that 79%, 74% approve of hunting but do not hunt. Thus, the majority would seem to fall squarely on the side of hunters. But do non-hunters (the 79% who don't hunt but are not anti-hunting) approve of how hunting is used in wildlife management and if they do or do not, is their voice heard? Are they allowed to express an opinion? Who then has the say over how wildlife are managed in America, the hunters, the anti-hunters, or the rest of the American people? Again, in all this, majority or not, hunters fall back on their base preposition, they pay for wildlife and so they should have the say, the only say. In doing so, they are denying this right to even the 73% of Americans who favor hunting and 95% of the American people are left out of these decisions. One has to ask how such a system differs from the European one our Founding Fathers tried to avoid: wildlife being owned and managed by a small fraction of landowners verses a small fraction of the population who feel they own the "right" to wildlife and how they are managed. In both cases, the majority of the public is left out of the decision process. Central to the answers to all these questions are two more fundamental questions of first, who owns the wildlife in America and second who is paying for their management/conservation? If we can answer these questions, then we at least define the "rights" of the different sides in the overall argument. So, first, who owns the wildlife in America? As mentioned above, our founding fathers abhorred the European system where large landowners also owned the wildlife on those lands. To avoid these problems in the new more egalitarian society they were forming, the formers of our government declared that each state claimed ownership of wildlife on behalf of its people. This state ownership was reinforced by the Greer v Connecticut Supreme Court decision that forbid interstate transport of wildlife killed within a state and "to confine the use of such game to those who own it, the people of the state". So clearly, from the beginning to today, we the people, ALL of us own the wildlife within our respective states. And not only do we own the wildlife, imbedded in that ownership is the right to regulate it by all of us. Further, IF that wildlife is migratory or lives on Federal lands in a state, not only do state residents have the right to regulate it but so does the rest of the nation. As stated in the Constitution, "Congress (all of us) shall have the power to dispose of and make all needful rules and regulations respecting the territory or other property belonging to the United States" (Article IV). This puts most wildlife in the National public trust and this right has been repeatedly upheld by the Supreme Court. So clearly stated, all wildlife belongs to all the people and all the people should have a say in how it is managed. What about the argument that those who pay should have the most, if not all, the say in how wildlife is managed? This brings us to the more fundamental question of who actually does pay for wildlife management in the U.S.? Is it just the hunters? And what wildlife are they paying to manage? There is no doubt that hunters pay a large amount of money to manage wildlife. For many states, game agencies are strictly funded by hunting license fees, to the tune of millions of dollars. Figures range around 600-700 million dollars nationwide. In addition to the hunting license and fees, the Pittman-Robertson act in 1937 dedicated a 10% excise tax on firearms and ammunition to be spent on wildlife restoration. This fund generates around 150 million dollars a year to be distributed to the states. If we add to this figure an estimated 10 BILLON dollars hunters spend when they go hunting, it all comes up to an impressive amount of money they spend on wildlife. So, maybe they should get the say? But wait a minute, let's look at the possible contributions from non-hunters. Regretfully, non-hunters who use and enjoy the outdoors do not pay an excise tax on sporting equipment. They had a chance to do so but did not follow through, but that is another story. 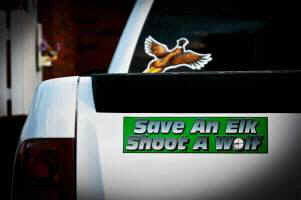 Though they do not contribute to wildlife by an excise tax, do they contribute in other ways? Let me count the ways. First fees. It is true we don't have a wildlife watching fee or license, though that might be a good idea! But non-hunter, when they use the great outdoors do pay fees, camping fees, entrance fees. How much? On the state level, it varies from state to state with a state like California generating 81 million dollars in park fees and more modest 3-10 million dollars in other states. If we use a modest 10 million dollars a year average by state, nationwide, park users pay 500 million dollars a year toward the maintenance of the lands AND by default wildlife on those lands. Add to that, the fact that general tax revenues are also used to make up any difference in expenditures probably in an equal amount. This means general taxpayers, 95% of which do not hunt, pay several hundred million dollars in state taxes to support parks AND the wildlife on these lands. Add to that the average 1 million dollars per state taxpayers check off on their tax forms for nongame species and the total state contributions come up to around 1.5 billion dollars a year. What about the Federal level? For National Parks, entrance fees generate around 25 million dollars a year. But the National Park budget, is around 3 billion dollars a year, again, paid for in grand part by the 95% non-hunters. We have to add to that the annual budget of the U.S. Department of Fish and Wildlife of 2.5 billion dollars. Also, the U.S. BLM (960 million dollars) and the Forest Service (5.1 billion dollars), which maintain large tracts of land for wildlife, add another 6 billion taxpayer dollars to the pot. I am sure I missed some other state and federal agencies whose goal it is to maintain lands and thus the wildlife on them but this should do for now. Adding up the state revenues and the various Federal sources, we see that recreation users and general taxpayers support wildlife to the tune of around 12 BILLON dollars annually. This compares to the annual 800-900 MILLION dollars generated by sportsmen. But how about that 10 billion dollars generated by sportsmen spending? If we compare the number of people participating in hunting versus other outdoor activities, the latest figures are: 24 million hunters vs. 317 million outdoor enthusiasts. Of those, more people go birdwatching (67 million) than hunting. If we assume a similar per person spending as hunters, then these non-hunters are spending over 130 billion dollars! So, I leave it up to you to decide, are hunters the only ones paying for wildlife? One last important note. Although hunters do pay hundreds of millions of dollars for wildlife management, that money is normally earmarked for specific wildlife, the ones they hunt. Though some money is spent on nongame species, it is done grudgingly or is listed as a side benefit. Most game agencies are not paid to nor really care to manage non-game species. They know where the money comes from and cater to hunters to "put more game in the bag". State game commissions are the same in that they know who they are paid by and as the name indicates only deal with game species. What this does is produce single species management where wildlife in general, the supposed great benefactor of the hunters largess, are ignored or worse yet, like predators, treated as vermin to be hunted without control because they interfere with game species. This also leaves the other 95% of the population, who is really paying the lion's share for wildlife habitat, with little or no say on how the other 99% of the wildlife are managed. This is wrong and needs to be changed. We need a dramatic change in how wildlife are managed in this country and the separation of "game" management and wildlife management is the first critical step. Let the game agencies with their millions of hunter dollars manage the deer and the ducks but let the new wildlife agencies manage the rest of the wildlife the way they should be managed, based on sound ecological science, not hunter demands. It is time we stop sacrificing the many for the few in the wildlife world and start managing our wildlife as the integral part of the ecosystems they are. John W. Laundré is a cougar biologist who has studied cougars for over 20 years both in the U.S. and Mexico. He has published extensively on their ecology and behavior and is the author of the upcoming book: Prairie Phantoms the Return of Cougars to the Midwest to be published by the University of Wisconsin Press. He currently is an adjunct professor at the State University of New York at Oswego where he teaches and as Vice President of the Cougar Rewilding Foundation advocates the return of cougars to their former range.